You can use the Phone Number Permission Check on the Geo Permissions page to confirm the numbers you care about are not in these ranges. High-Risk Special Services Number ranges - These number ranges include premium, shared-cost and special services number types. Fraudsters carry out abuse to these number types because they are allowed to charge a higher toll-rate because these number ranges offer special services such as psychic lines, government lines, adult or other paid-for services. These number ranges change infrequently and Twilio allows you to view these number ranges on the Geo Permissions Console page. Twilio reserves the right to update this list without warning and there is no guarantee for the correctness and completeness of this list. Here are some recommended guidelines for applying appropriate permissions for your customers. On one hand, you might have an anonymous trial user, with free-credit that should be blocked from calling all destinations known for toll-fraud. On the other hand, for a high-valued and trusted customer that values call completion rates, you may want to grant them permissions to call anywhere, since you know they will reimburse you for any abuse on their account. Untrusted user, means chance for abuse is high. Special services destinations occasionally need to be called by businesses. How do I know if my calls are being blocked by Geo Permissions? You can navigate to the debugger and search for the warnings 21215, 32205, 13227 which correspond to the 3 different types of voice calls that can be blocked by Geo Permissions. How do I detect unusual usage in my project? It’s important to continuously monitor your usage for any unwanted abuse, particularly the usage in any subaccounts. Usage triggers can be used to monitor volume of calls or minutes each day. Examples of anomalous usage is 5 times more usage on a weekday compared to average usage over the last 3 weeks, or a spike of usage on a weekend or holiday when you don't expect business. If you notice any irregular activity on your project immediately contact help@twilio.com, as well as your Twilio account manager. You can also suspend a sub-account in the Console or via the REST API. When an account is suspended it cannot make voice calls, send SMS, etc. Twilio can suspend all activity on a project or sub-account, or block a certain prefix while an investigation ensues. It is better to be safe and temporarily out of service, than risk high charges that can be excess of $100,000. Twilio’s customers are responsible for all usage on their accounts. The highest-risk countries for toll-fraud in world? The following countries are the destinations leading to the largest amount of revenue loss from toll-fraud and are also the countries advertising the largest number of international premium rate numbers used for toll-fraud. 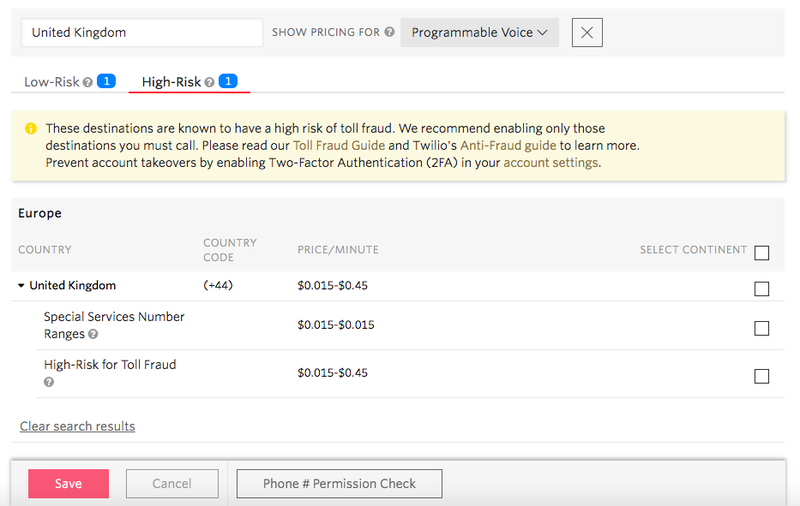 There is risk associated with calling low-risk destinations in these countries since number ranges can be re-allocated for fraud before Twilio can classify as high-risk.